Those were the days when the television was a new family member; when people had a schedule for their favourite programs; when the whole family sat together and enjoy an hour or two of togetherness. Exactly at 5’Oclock in the evening, our Television used to give a loud call - “Scooby Doo, Where Are You?” Books were thrown away and children were sucked inside an enchanting animated world. Scooby-Doo, the adorable, cute dog was one of the most beloved characters on the Cartoon Network. Created by Hannah – Barbera, this cartoon is about a talking Dog and a gang of four mystery-solving teenagers. In each episode, all of them run into some sort of paranormal activity and unravel the mystery behind the so-called paranormal occurrence. The stamp will be will be issued July 14. 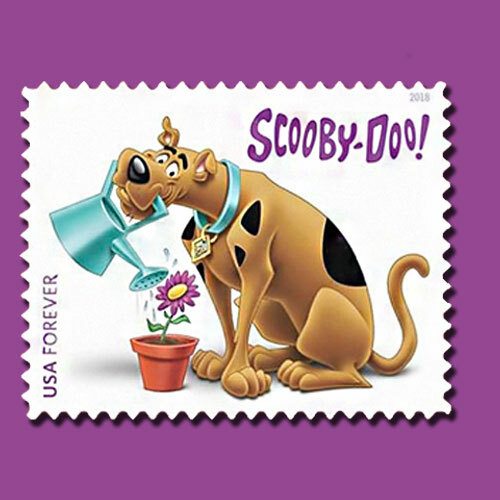 This nondenominated (50¢) forever commemorative stamp depicts Scooby-Doo helping out by watering a blossoming plant in a flowerpot — a simple act symbolizing a component of the ‘Doo Good’ campaign’s effort to provide young people with tools and activities geared toward enriching the environment. It was Scooby Doo and his gang who taught our generations that ghosts don’t exist. The more evil thing in this world is an evil-minded human.